Are you a chief impact officer overwhelmed by a new impact knowledge ecosystem of many impact knowledge sources and maze of standards, framework, and tools? Impact Knowledge Graph is a publicly available resource (designed with freemium Impact Cloud ) that allows you to search and modify your entire impact management strategy with structured knowledge and unique impact for each initiative or program. This Impact knowledge Graph is shareable, has clear impact statement, built quickly, has elements of evidence, risk, and assumptions. SoPact collaborates with leading knowledge sources and integrates them in a structured, open source and easy to use form. Impact Cloud appropriately combines impact themes, strategy, evidence map, and indicators. Impact Practitioners, Chief Impact Officers, and organization leaders can start with out-of-box impact themes from GIIN or create own based on a library of impact themes & impact strategy based other out of the box impact themes. Asset Managers and Assets can share and collaborate with a structured impact knowledge graph and align with their internal goals. Refer Impact strategy for more information. Now that impact knowledge graph packages structured knowledge, it’s time to make them actionable. Customization Based Systems: Many legacy custom applications require software vendors to modify business objects. Hence, the user has to rely on the software vendor to customize the code based on a programmatic approach. .NET, Java or legacy client/server application fall into this category. Hybrid Systems: While systems like Salesforce CRM can configure, each Salesforce instance must be customized by expensive Salesforce developers (either in-house or by an external consultant). For example, if you want to upgrade from IRIS 4.0 to IRIS 5.0, you must rebuild your metrics catalog. There are advance services possible but building business user-configurable system that is flexible takes a lot of effort. Most social sector organizations cannot develop such software. Business User Driven Configuration: No developer configuration needed: Impact Cloud is designed in such a way that any user can configure business rules without any technical knowledge. It is at least ten times faster to implement than Salesforce and easier to maintain. While this usage is relatively common some larger organizations have started to adopt Salesforce and other custom development tools. Impact data are quite dynamic and context-sensitive. Accurate data aggregation requires a flexible system. There are many challenges of aggregating results from different partners (grantees, investees or programs). The partner may not have the same context of impact. Has any foundation or funds successfully deployed Salesforce or other custom software that can scale to hundreds of grantees or investees and aggregate qualitative and quantitative results unique to each of them? Sopact Impact Cloud TM is one the most flexible, comprehensive and easy to use platform that simplifies various frameworks and standards and makes it easy to engage different stakeholders. Not only different entities below can aggregate results, but it also provides an amazingly easy to use data aggregation at the hub and spoke level. Below are a few examples of a few hubs. Businesses can work with different departments, regional areas or business units by impact area to aggregate results on the predetermined frequencies. Funders can work with investees or grantees to aggregate output, outcome and qualitative results on a regular time. States & Countries can work with different NGOs and agencies working on sustainable development goal programs to aggregate results and build effective SDG Tracker or customer impact aggregation. At the spoke level Impact Organization working close to programs can easily aggregate system data from any data sources and simplify report aggregation. Theory of change led applications of Impact Cloud simplifies impact reporting for funding or portfolio organizations or program organizations working close to beneficiaries or stakeholders. The platform is designed to encourage a better social impact knowledge collaboration and simplify due diligence, portfolio management, data management, and lean data analytics. The journey start with creating Impact Knowledge Graph as described in Impact Strategy. As described in Impact Strategy, organization can start with publicly available, sharable or new Impact Knowledge Graph. Data Strategy (Very Important Feature): Align Metrics with Data Collected from different sources instantaneously. Assign Core, Program and Investee/Grantee specific metrics. From well-tested and reporting framework and template build impactful report for different stakeholders. SROI Application uses all the results from stakeholder data and survey results and calculates results as defined by Social Value International (SVI) 7 Principles of SROI. This application is certified by the SVI. Impact Practitioners are encouraged to use Free Impact Strategy application within Impact Cloud. This application allows to not only reuse public knowledge but allows to create additional knowledge similar to Wikipedia. SoPact aim to build a bridge between strategic impact standards bodies and impact practices to simplify the use of standards and framework and create an ecosystem provider who can collaborate to grow the space by making it actionable. SDG Tracker for rapidly aggregating results. 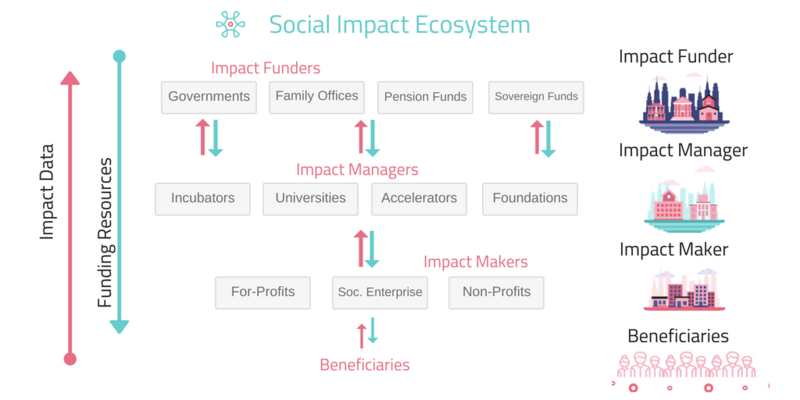 Early-stage impact startup with limited resources and no impact data can use evidence library, SROI and impact management approach to build effective short impact report to align with impact investors. Work with funders to implement impact data aggregation program. Work with nonprofits and social enterprise to build a simple data collection & aggregation system. Work with nonprofits and social enterprise to build outcome management or social impact assessment approach. Work with impact investors looking to start on impact strategy to refine impact strategy and reporting -- acting Chief Impact Officer! Scale your impact practice. Sign up for Free Impact Cloud.